Oh, what fun, this one was! Matilda is a precocious child, much to the dismay of her parents. They don't understand her thirst for reading and wish she'd just sit in front of the television and watch with the rest of the family! While her dad is off working as a smarmy used car salesman, her mother is hitting the bingo halls and leaving four-year-old Matilda alone at home. Matilda walks to the library and spends her afternoons reading. The librarian, at first, is astonished that Matilda is there alone. 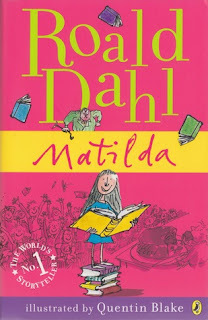 She is even more amazed that Matilda can read, and Matilda eagerly reads anything that the librarian recommends to her. Soon, Matilda has finished all the children's books and Matilda is reading and comprehending classics written by Charles Dickens and others. When Matilda starts kindergarten, her teacher is equally astounded at Matilda's abilities. Miss Honey tries to reason with the boorish principal, Mrs. Trunchbull, to put Matilda into a higher grade level but Trunchbull will have none of it. 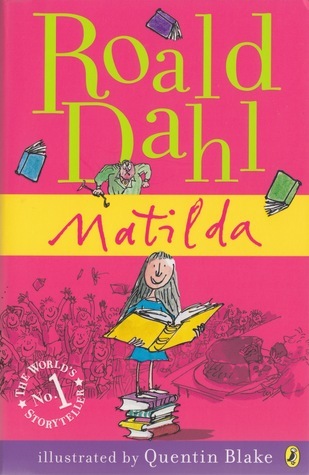 So, Miss Honey gives higher level books to Matilda to read during class so that she will continue to learn new things. My daughter and I loved this book! Mrs. Trunchbull was such fun to hate. She mistreated the children, holding them up by their ears and flinging them by their hair. Her antics were preposterous, but it made for a funny story. We also loved how Matilda came to Miss Honey's rescue and hatched a plan to get back at Mrs. Trunchbull. Matilda is so sweet and clever, and you can't help but love her! I so loved the librarian, Mrs. Phelps, who took Matilda under her wing and encouraged her love of reading. Each child needs a librarian like her! We also watched the 1996 film adaptation, and Danny Devito and Rhea Perlman were perfectly cast as Matilda's parents. We enjoyed it. 5 stars!! I loved it, and you should definitely put it on your TBR if you enjoy MG fiction. I loved this book as a kid and watched the movie so many times. I need to find a copy and reread it. I'm so glad you loved this book! It's on my wish list and sounds delightful!